Layered Watermelon Popsicles - What About Watermelon? These layered watermelon popsicles make the perfect treat for a hot summers day. 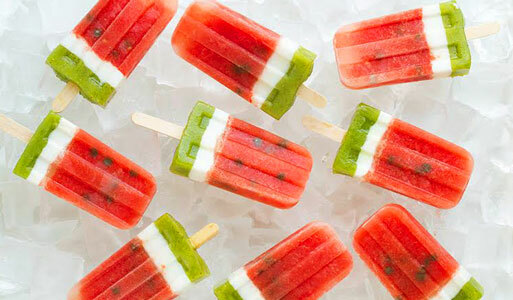 Made with watermelon, kiwi fruit, lemon and coconut milk they are a healthy alternative to a paddle pop. 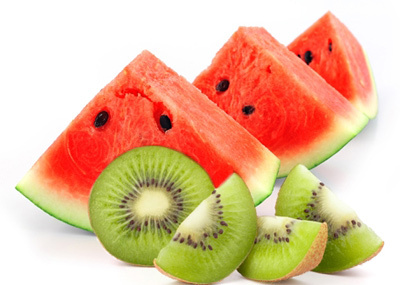 In a blender jug, combine cubed watermelon, 2 tablespoons of sugar and lemon juice. Pulse until well combined. Holding foam back, divide this mixture between 10 Popsicle molds. Sprinkle the dark chocolate chips evenly between the 10 molds and then using a fork disperse throughout the watermelon mixture. 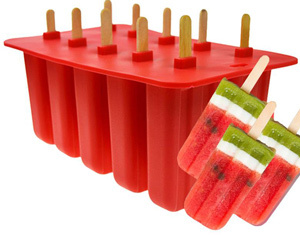 Place cover on molds and insert 1 paddle pop stick into each of the 10 Popsicles. Place into the freezer for a minimum of 3 hours. Once three hours is nearing you can begin to make the next component of the popsicles. Place your coconut milk and 1 tablespoon of sugar into a bowl and whisk until all sugar has dissolved. Place coconut milk mixture into the refrigerator for approximately half an hour. Remove popsicles from freezer and disperse the coconut milk mixture evenly among the 10 molds. It will be approximately a tablespoon per Popsicle of coconut mixture. Place popsicles back into freezer (no need for lid) for three quarters of an hour. Using a spoon, scoop out the flesh of your six kiwi fruits. Place kiwi flesh and 2 tablespoons of sugar into a clean blender and pulse until well combined. Place blender jug into refrigerator for half an hour. Remove popsicles and spoon about one tablespoon of kiwi mixture into each. Return popsicles to the freezer to set completely for approximately three hours. Remove popsicles from molds, serve and enjoy! Those popsicles look so yummy & there pretty too.I’m gonna have to give these a try for sure.Thank you for the recipe !! !